It’s a common assumption that fleas go away once the winter season hits. The freezing-cold temperatures makes it difficult for common pests to survive, but this doesn’t necessarily mean that a flea infestation will disappear when autumn ends. Fleas are highly resilient creatures that have survived for millions of years, during which they’ve learned to adapt to their surroundings. Cold winter temperatures may slow down the growth rate of an infestation, but homeowners must continue the fight to exterminate these blood-sucking parasites. Fleas thrive in environments that are warm and humid; therefore, you should aim to create a cool, dry environment inside your home. I know what you’re probably thinking: it’s already cold during the winter, so why do I need to alter my home’s environment? Even if it’s cold outside, it may still be warm inside your home, and that’s where fleas are most likely to reside — assuming there’s a warm-blooded meal for them to access. Avoid cranking the thermostat up to 76 degrees Fahrenheit or warmer. Instead, keep it around 70-72 degrees so it’s comfortable but still somewhat cool to deter fleas. Equally as important as temperature control is humidity control. Being that most families use central heating and/or space heaters during the winter, homes are generally more humid during this time of year. 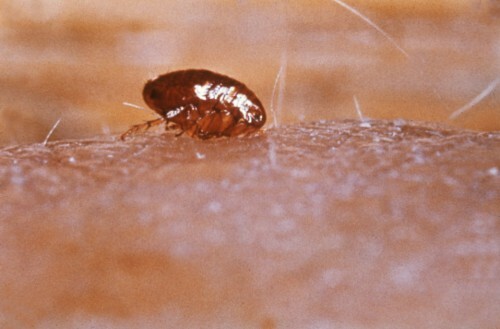 The added moisture vapor in the air creates the perfect environment in which fleas can thrive. The good news is that you can combat this problem by setting up a dehumidifier. These otherwise simple devices work to extract moisture from the air, promoting a dryer environment inside your home. If you plan to use a dehumidifier, though, you’ll need to get into the habit of emptying its water on a regular basis. Depending on the humidity level of your home and region, a dehumidifier can produce as much as 65 pints of water in 24 hours. Of course, there are other steps you can take to control fleas during the winter season as well, such as vacuuming. I know this probably sounds like common sense to most people, but maintaining a clean home is essential to the deterrence of fleas. These blood-sucking parasites often hide deep in the fabrics of carpet, where they patiently wait until a host walks by. Vacuuming your floors on a daily basis can eliminate up to 96% of a flea infestation. Do Fleas Go Away In The Fall/Winter?